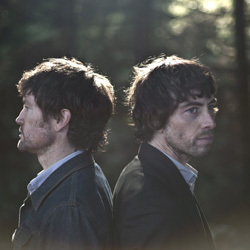 The Walls have announced their first Dublin show of 2011. In between a host of summer festivals, the band will stop of in the capital with their highly praised two man live show. Ticket’s are priced €13.50 and are on sale now through Entertainment.ie and it’s all taking place at Liffey street’s Grand Social venue on June 30th. Last month The Walls released the Bird In A Cage EP, the first new material since 2005’s New Dawn Breaking. They’re currently building up hype for the release of their third album, Stop The Lights, which is rumoured to hit shelves next year. This entry was posted on May 24, 2011 at 10:53 pm and is filed under IRISH NOISE!, Music, News with tags Bird In A Cage EP, Cork Midsummer Festival, DeBarras, Galway Arts Festival, Grand Social, New Dawn Breaking, Sea Sessions, Stop The Lights, Temple House Festival, The Walls. You can follow any responses to this entry through the RSS 2.0 feed. You can leave a response, or trackback from your own site.